It’s an easy answer: You can do it, but it won’t work. Here’s why. Plants produce a wide range of chemicals aimed at defending them from attack by insects and diseases. Among these chemicals are some that inhibit the growth of other plant species. The production of compounds by one plant species that are toxic to another is known as allelopathy. The production of chemical compounds by a plant that are toxic to members of the same species is known as autotoxicity. Plants produce these compounds to help “carve out” a space for themselves and reduce competition from other plants for water, nutrients, and light. Alfalfa is a plant species that exhibits autotoxicity. There are a number of potentially autotoxic chemicals produced by alfalfa, one of which is called medicarpin. This compound is more concentrated in top growth than roots and is water-soluble, leaching readily into the soil from both decomposing plant material and growing plants. Once a stand of alfalfa is killed, whether by tillage, spraying, or winterkill, the autotoxic compounds are released into the soil environment. How long they remain and what affect they have on a new alfalfa seeding is a function of soil type, temperature, tillage, rainfall amount, and the amount of time between the old and new stand. On sandy soils, where the toxins are more available and more easily taken up, the autotoxic effects are more acute but are less persistent because the toxin is thought to more quickly leach out of the root zone. On heavier textured soils such as clay, the toxins are more tightly adsorbed to soil particles. Consequently, the effects are less pronounced but are longer lasting. The autotoxic compounds are microbially degraded over time, so conditions that favor microbial growth such as warm, moist soils reduce the persistence of the toxins. Tillage affects the level of toxin in the soil. More aggressive tillage will better mix and dilute the toxins. Wisconsin research showed the effects of autotoxicity to be greater in no-till fields than those that were moldboard plowed. The age of the existing alfalfa stand will also affect autotoxicity. Younger plants (those one year old or less) contain fewer toxins than older plants. This means that failed seedings or even new seedings that winterkill can be seeded back to alfalfa with little yield reduction. The time interval between eliminating an old stand and planting a new one has an important influence on the effects of autotoxicity. The longer between tilling the old stand under and seeding the new one will reduce the effects. As a general rule of thumb, it’s best to have one year between the termination of an existing stand and the seeding of a new stand. 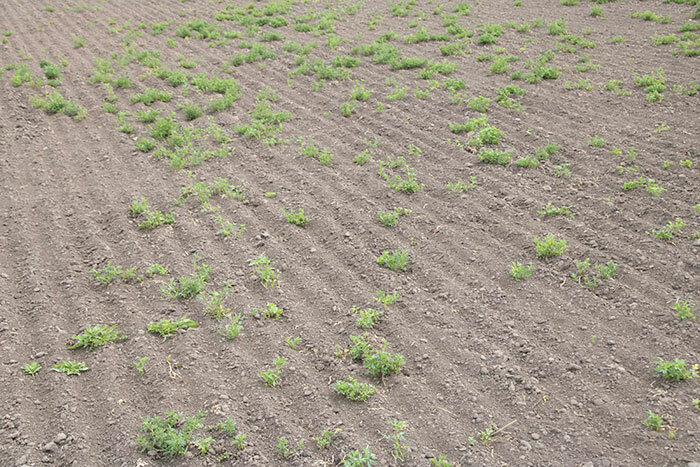 Spring seedings of alfalfa following a fall-killed alfalfa stand from the previous year generally yield only 60 to 70 percent of a stand with a full year in between termination and seeding. The density of the previous alfalfa stand seems to have very little practical effect. University of Wisconsin studies have shown that stand densities as low as 30 stems per square foot exhibited autotoxicity similar to stands with 70 plants per square foot. When alfalfa stands become thin either by natural attrition or from winterkill, there is often the inclination to simply no-till alfalfa into the existing stand. In this case, both plant competition and autotoxicity work against the development of productive new seedlings. A classic University of Missouri study involved planting alfalfa seeds in a wagon wheel fashion around an existing alfalfa plant. Within 8 inches of the plant, new seedlings rarely survived. From 8 to 16 inches away from the existing plant, new seedlings established, but productivity was greatly diminished. Given the cost of elite genetics alfalfa seed, it makes little sense to try to achieve anything less than a full, productive stand. This means that “pushing the envelope” on time between alfalfa stands or trying to thicken and existing stand makes very little economic sense.